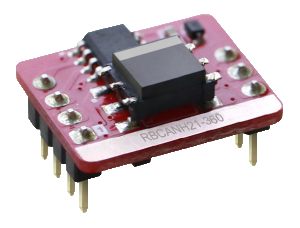 The RBCANH21 series of CAN isolation transceiver module is a single channel, high speed, industrial bus that converts TTL/CMOS level to CAN bus differential level and uses IC integrated technology to achieve signal and set power isolation. This series consists of very compact models with a DIP8 package and a bus that can support a maximum of 110 nodes. It features two-port isolation of 3.0kVDC, baud rate up to 1Mbps, as well as set isolation and ESD bus protection in one. This series is RoHS compliant and also has EN60950 safety approvals. Notes: 1. The performance indexes of the product models are as listed in the data sheet above, but some indexes of non-standard model products will exceed the above mentioned requirements. Contact factory for specific information. 2. PCB surface may have micro-color difference-this is a normal phenomenon & does not affect use of product. 3. Products shall be classified according to ISO14001 and related environmental laws and regulations & should be handled by qualifying units. -Please read instructions carefully before use; call factory if you have questions. -This product is powered by DC power supply. 220VAC power supply is prohibited. -Do not dismount and assemble the product without permission to avoid failure or malfunction of equipment. -Ex factory inspection and quality control have been strictly conducted for this product. 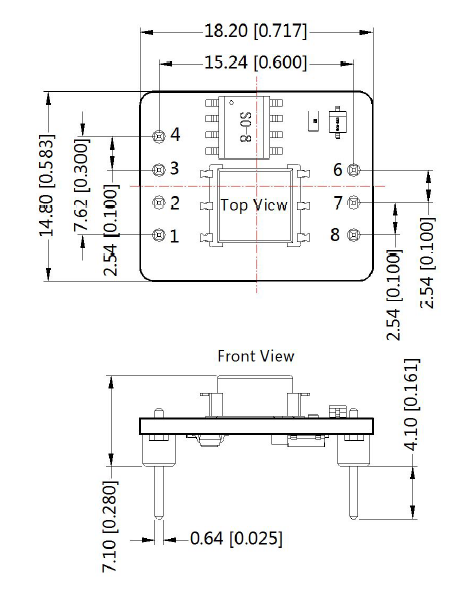 If any abnormal operation or possibility of failure occurs in internal module, please contact factory for support.